Keeping up with the growing demands of your fast-paced business can be a handful. As soon as a vacancy arises, you want it filled immediately so your clients don’t suffer, or other employees don’t feel overworked. Considering how competitive the labour market is today, you probably want to lock down a good candidate before someone else snaps them up. We get all that! But making a hasty hiring decision can actually hurt you, in the long run, more than you think. Employees who leave, for any reason, and will have to be replaced. The costs can be quite high as it takes time to source, onboard, and train a new employee, the organisation must absorb a certain amount of lost productivity in the transition from one employee to another, and there are often many other sources of ‘cost’ related to the loss of one employee and hiring of another. Businesses every year lose an exorbitant amount of money, time and energy getting rid of bad hires, which is why, it’s imperative that you make sure the person you recruited is actually right for you. According to CareerBuilder, 41% of companies surveyed have said that a bad hire in the last year has cost them at least $25000, with about 25% of those companies saying that they lost $50000. The biggest cost of a bad hire is the revenues that they are not generating. By not being able to perform the job, close the sale or manage the process, this employee is costing you money. Moreover, once you hire someone, it’s not that easy to get rid of him or her even when they’re not doing a good job. When you consider the cost of their bad performance, the damage they can cause to your business and reputation, and the amount you might have to pay in severance packages – the costs add up! Your bottom line can be affected significantly if the employee is not suited for the job or has a negative attitude. Given the inter-dependent nature of most workplaces, their incompetence also affects their team members’ ability to finish tasks and meet deadlines. 36% of the companies said that a bad hire adversely impacted their employee morale. It is frustrating for your management team to have to deal with a new recruit who is reluctant to learn, bad at their job, or just unpleasant to work with. It’s even worse for other members of their team who might have to pick up their slack or work with their bad attitude. 22% of companies said that a bad recruitment decision had a negative impact on client solutions. If your business is heavily reliant on client relationships, then it’s not a good idea for you to keep changing staff members that maintain those relationships. The client might feel like your business isn’t stable and won’t get the seamless experience of working with familiar faces. While we understand the urgency you might feel to fill available vacancies so your business can run smoothly, it’s actually better for you to hire the perfect person for the job who will stick around and make your clients happy in the long run. Roy Maurer in a recent article on SHRM noted that it’s better to let quality trump delay despite the pressure on employers to hire under strict time constraints. In some really fast-paced industries, such as hospitality, for instance, it makes sense for you to not want to wait for too long. At peak hours, you need all hands on board, and you can’t afford to be under-staffed. It’s hard on your other employees and your management team is probably too busy to spend that much time on recruitment. Under Australian laws, however, it’s not that easily to fire someone after you’ve hired them. As we’ve mentioned above, a bad hire could end up costing you a fortune so it’s always prudent to hire carefully. Don’t rush and let quality trump the concerns over delay! A thorough background check on a candidate can give you a good insight into their character and compatibility with the job. If their referees are reluctant to talk much about them, or if their police checks reveal a criminal record that would directly affect their ability to perform the role, then you have the opportunity to consider beforehand whether this hire will really work out for you. Moreover, it doesn’t even take that long to vet someone’s background. 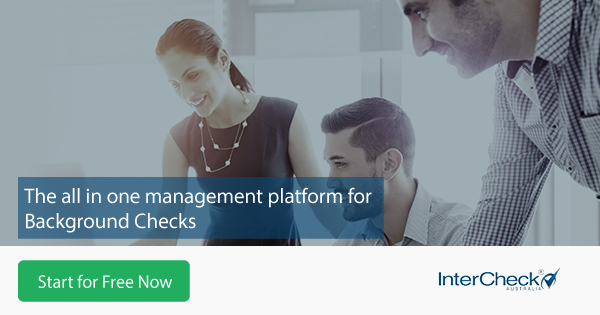 Police check brokers such as InterCheck can get back to you within 48 hours, and they’ll walk you through the entire process so it’s barely any hassle for you. Ultimately, making this effort will pay off in the long run and save your company money, time, and energy. Dr. James (Jim) Ice Ed.D. Traditional wisdom suggests that it typically takes 6 months to validate you have made a bad hire… however, for some companies, it may take them up to 3 years (if ever) to remove poor performers (i.e. often try them in other jobs, with other managers, regulations). Bad Hires are said to cost the company 2-5 times annual salary. When you consider costs of – recruiting (e.g. advertising, internal resources time for document reviews/phone screens/interviews, travel, relocation), potential external recruiter costs (20-40% of annual salary); and lost opportunity costs (e.g. lost sales, reduced productivity, overtime) and retraining… For Key roles – might be as much as $7,000/day. I tell my clients that every hiring decisions is a Million dollar decision…. – What sort of position do they hold? What is the impact on the performance of the organisation? A front line sales person who is not performing also impacts organisational reputation and revenue from lost sales. – How easy or hard it is to attract a new, qualified candidate? Is it an easy-to-fill position, or a hard-to-fill one? How much training or learning curve is there to the position? The longer it takes to fill and get the individual up to speed, the higher the cost in seeking a replacement. – How long have they been in the role? Do they have a contract with severance stipulations, or are they within a probationary period? Sometimes it can take quite awhile to determine that someone isn’t the right fit, but usually it is evident fairly quickly. Organisations need to not be shy about cutting the cord if they feel something isn’t working, because their instinct is usually correct. Best way to help avoid hiring the wrong person is to interview for culture fit in addition to skills and abilities. Talk to them about their likes and dislikes in a workplace, what type of boss they like, what motivates them, etc. Also be sure to ask behavior-based questions to ascertain competency in the interview. Don’t be scammed by people who say they can do something with no evidence to back it up. The earlier the wrong candidate is identified, the more likely appropriate measures can be taken. The idea of letting an employee go is usually the first reaction, but it should actually be considered as the last option in order to keep the costs and losses already incurred as low as possible. Offering additional support, spending more time on the onboarding process or assigning a new or different role are more viable options that should be considered first. Even though misjudgements in recruiting cannot always be avoided, companies can minimise the risk of a bad hire and the consequential costs by reviewing and evolving their recruiting processes, making sure hiring methods have been adapted to recent market changes. In the past, I find that a person shows their true colours and whether or not they are a good fit within the first few weeks of being hired. Although it is common for a 90-day probationary period, I believe you are able to determine if someone is a good fit within 3 weeks of starting a new position. The big question is, how much does it cost you in monetary value. In monetary value, it costs much more than people think. While each dollar amount is different, the variables that need to be included are the costs for hiring (recruiting, HRIS, etc. ), time spent on interviewing, background checks, and the cost for training. The expense of time for each person involved should be included..
What are the Different Types of Pre-Employment Checks?